"Murderous London: A Story for Artists." By W. P. Frith, R. A. (1819-1909). 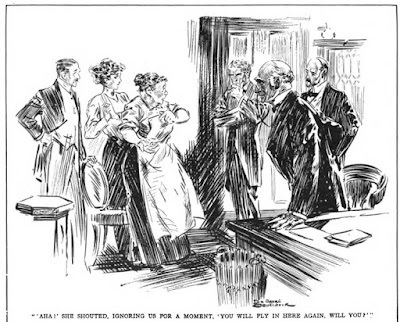 First appearance: Time, November 1888. "One of them burkers lives here! he's been and tried to murder me!" 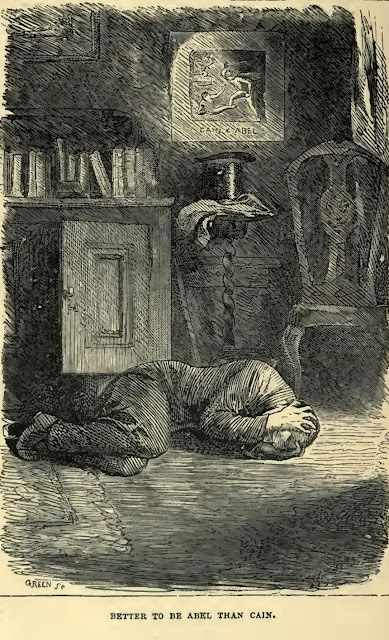 If he hadn't lived more than a century sooner, the "young man from the country" in our story could have, on reflection, taken some solace from Chesterton's observation: "The comedy of man survives the tragedy of man." his only foray into the fictionalized anecdote. 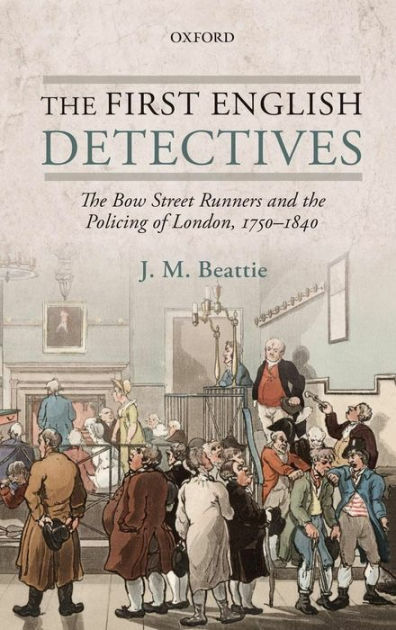 - A Bow Street Runner makes an appearance in our story; go to Wikipedia (HERE) for more about "London's first professional police force." - For their activities William Burke and William Hare could not have escaped the notoriety that even today attaches to their names; for just about everything you'll ever need to know about these two gentlemen, see Wikipedia (HERE), The Worlds of Burke and Hare (HERE), Historic UK (HERE), and Wikipedia again (HERE) and (HERE). By C. Langton Clarke (1857-1936). 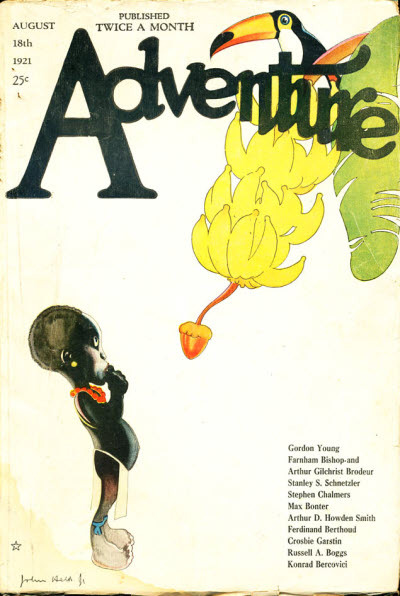 First appearance: Adventure, February 1911. 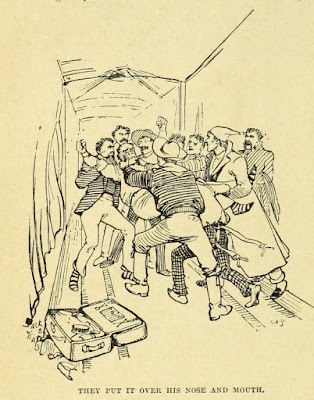 "From back of the tender came the sound of a pistol-shot and a cry of agony." Blood, they say, is thicker than water; sometimes, though, it can be even thicker than the iron-clad strictures of the law . 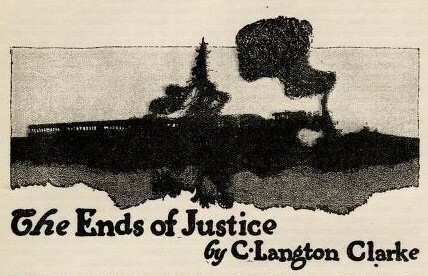 . .
- FictionMags describes C. Langton Clarke: "Editor, journalist and engineer. Born in England; died in Toronto, Canada." 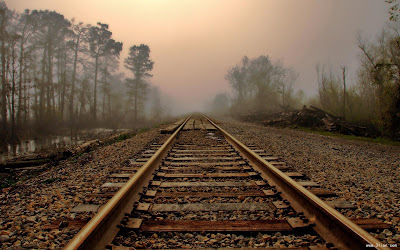 "Although it may just look like plain ole gravel this stone [ballast] plays a vital role in acting as a support base for the railroad ties and rails as well as allowing for proper drainage of water away from the rails (which is why the stone is always sloped downward and away from track)." The bottom line: "For children are innocent and love justice, while most of us are wicked and naturally prefer mercy." By Harris Merton Lyon (1881-1916). 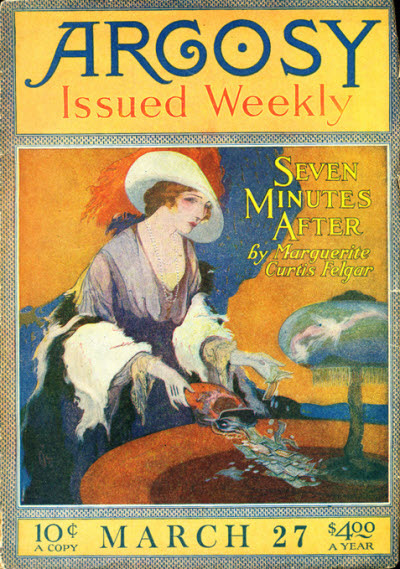 First appearance: Hampton's Magazine, March 1912. "H. says he can't come, as he is working on the case of the nearsighted crown jewel thief. Look up Mr. John Raffles, of 1111 Broadway." When it comes to finding the purloined Nero emerald, the right man for the job might not be a man at all . 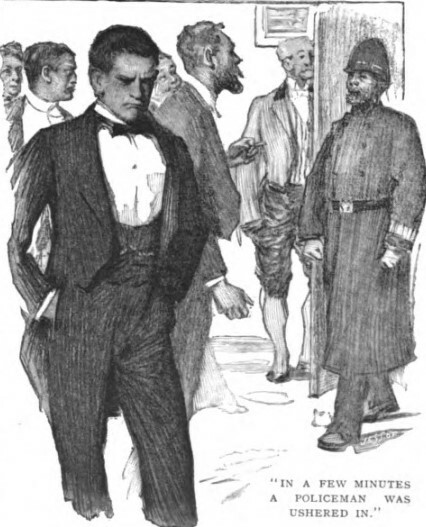 . .
Typo: "the trouble had began"
- FictionMags's chronological list of Harris Merton Lyon's output from 1907 to his death in 1916 (with one posthumously published tale) shows that most of it was humorous stories. 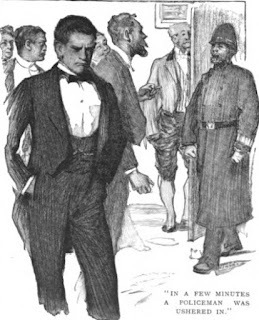 - The reference to Arsène Lupin's picking the pocket of the Sage of Baker Street is from Maurice Leblanc's "Sherlock Holmes Arrives Too Late" (1907), online at David Stewart's collection (HERE). 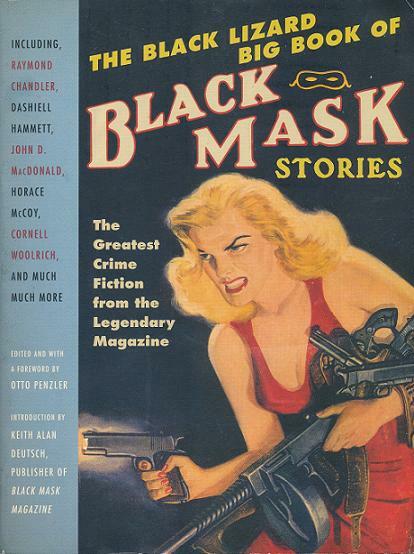 "Was There Sound, Mister, with Only a Deaf Man Living Near That Door, Passing It Twenty Times a Day"
First appearance: Black Mask, November 1948. 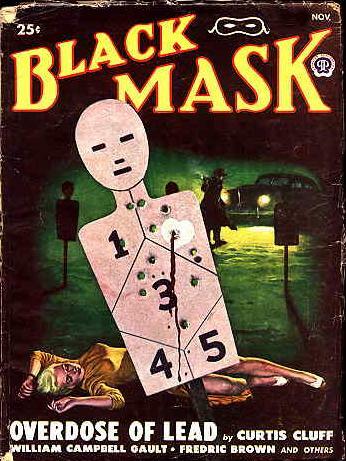 Reprinted in Black Mask (U.K.), April 1949; Ellery Queen’s Mystery Magazine, October 1953; and Suspense (U.K.), January 1959 (FictionMags data). "Would you try to save your wife from a killer? Seems like a simple question, but to Mandy's husband, it was one to stump the experts." 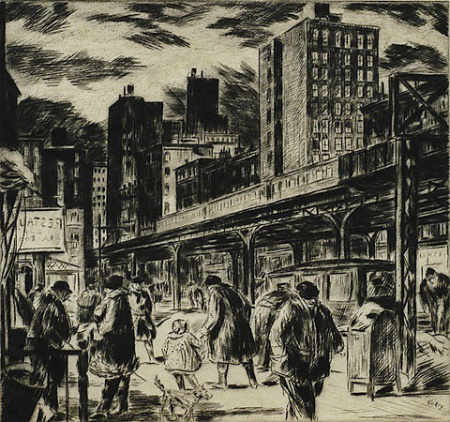 That silent man in the train station: should he be pitied—or executed? 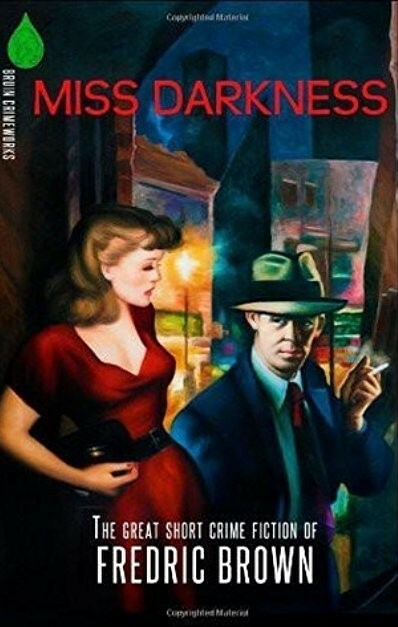 - For a comprehensive background article on Fredric Brown, the crime writer (as distinct from his SFFnal output), see The Thrilling Detective (HERE). - This story is discussed by Graham Powell at Nasty. Brutish. Short. (HERE), so beware of SPOILERS: "The twist ending to this short little shocker is worth the price of admission." - ONTOS has already had several close encounters with Fredric Brown: (HERE), (HERE), (HERE), and (HERE). The ears of heavenly justice . 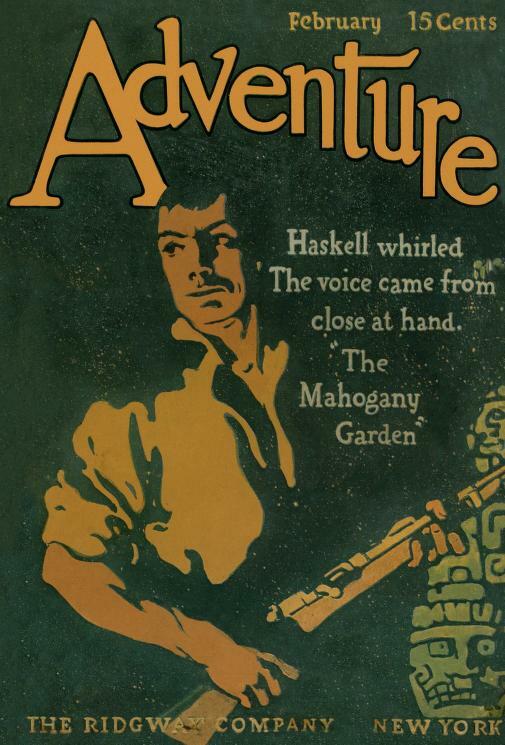 . .
First appearance: Adventure, August 18, 1921. ". 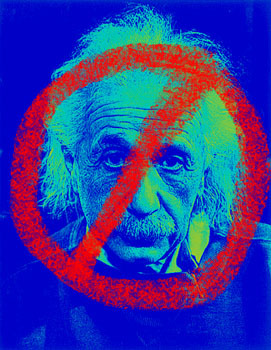 . . if you want me, you're not goin' to get me. You won't even get as far as that door!" It really is a small world, isn't it, when you run afoul of somebody you ran afoul of twenty years ago . . .
"Ire, strong and ill-controlled, blazed in his deep-set eyes." 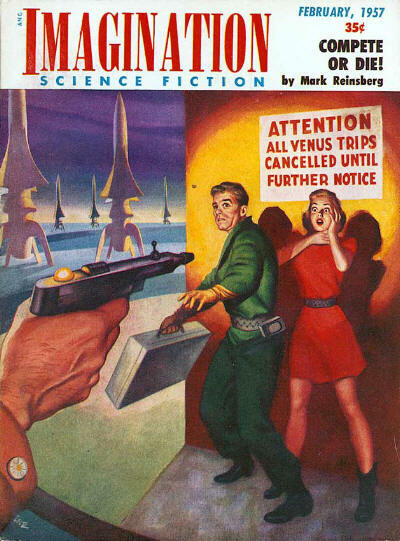 "Quickly he left the unpretentious base headquarters where society's defensive brain-force was centralized and at bay before the increasingly vicious assaults of the underworld." Typos: "collabotaors"; "New York Ruddy". 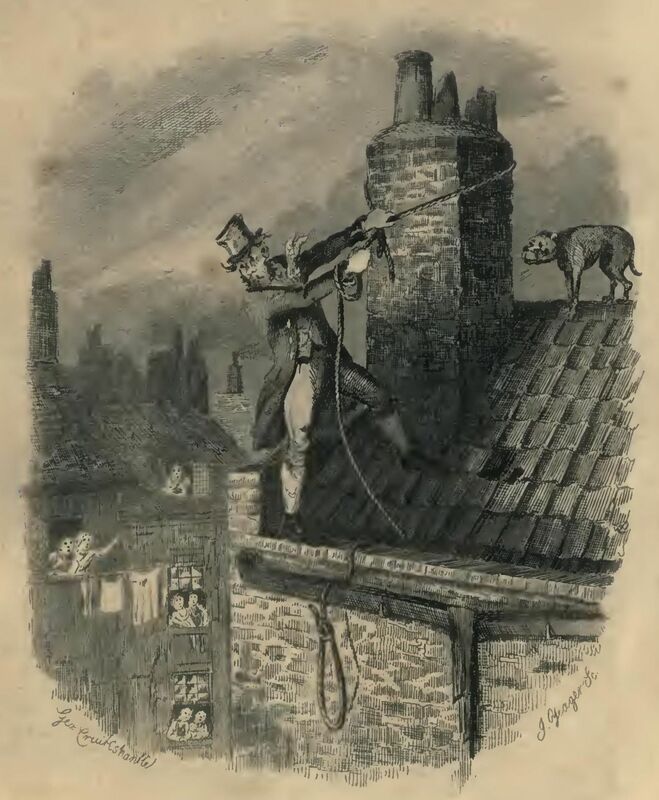 - Our undercover detective, pretending to be a gob (the old term for an American sailor), is frequently referred to as a "fireman," which doesn't mean "firefighter" here: "Fireman or stoker is the job title for someone whose job is to tend the fire for the running of a steam engine. On steam locomotives the term fireman is usually used, while on steamships and stationary steam engines, such as those driving saw mills, the term is usually stoker . . ."
— Wikipedia, "Fireman (steam engine)"
- Remember that our story takes place shortly after Prohibition went into effect; see the History.com article (HERE). 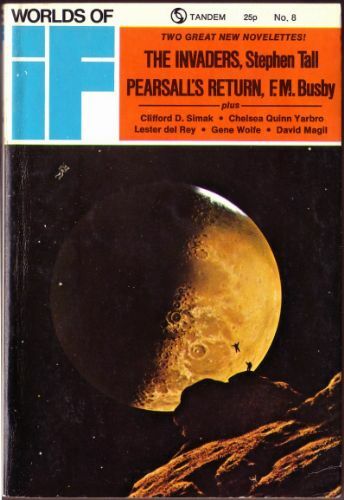 - There's almost no information about our author to be found; FictionMags's thumbnail: "Sailor. Probably from New York." "Dead, Lying There Dead, with Marks on His Throat—Murder, All Right"
First appearance: The Argosy, March 27, 1920. "So far as your happiness is concerned, he'd be better off dead, and I wish he was." right thing is doing the right thing . 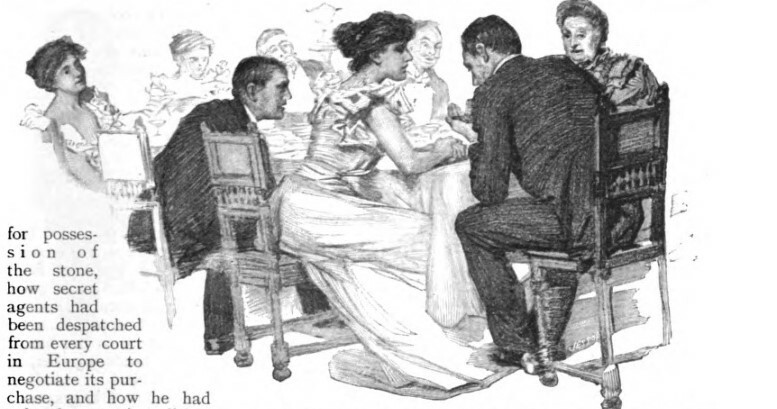 . .
"In the hand she held outstretched a bit of polished steel glistened in the lamplight." "It's him all right—only circumstantial evidence, but damn strong." 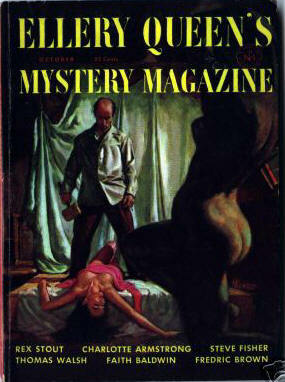 - We've run across uberpulpster Raymond King Cummings quite a few times; go (HERE) for those instances. "Certainly It Was Impossible — Except That Mr. Gru Was Stone Cold Dead . 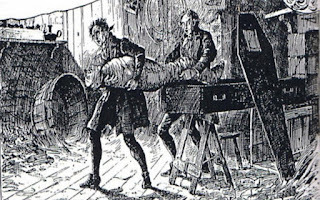 . ."
WOULD YOU BELIEVE a story set a couple of centuries from now that's also a locked room mystery? Uber-editor John W. Campbell would probably scoff, but, as our sleuth says, "You were wrong about nothing having changed in the past two hundred years. This was a crime which could not have happened then." 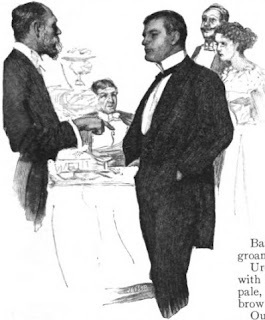 By Kendall [sic] Foster Crossen (1910-81). 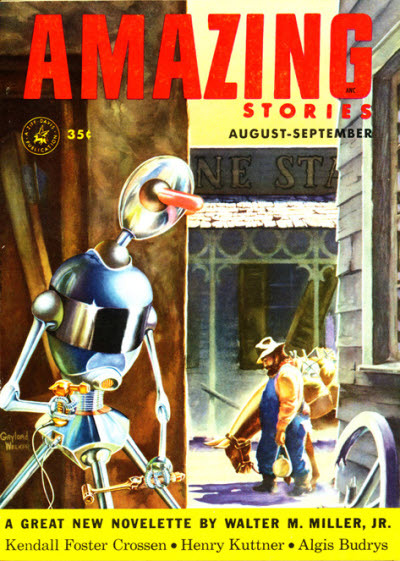 First appearance: Amazing Stories, August-September 1953. 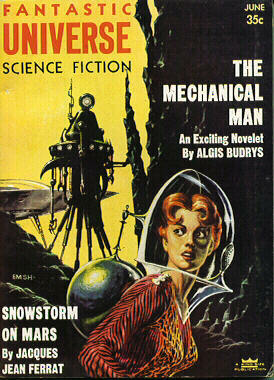 Reprinted in Amazing Stories (U.K.), December 1953 and Fantastic, February 1969. 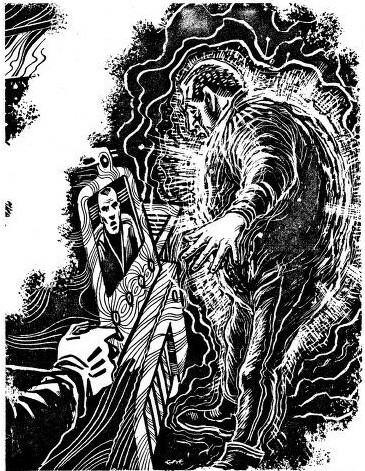 Online at SFFAudio (HERE) (PDF) and Archive.org starting (HERE) and finishing (HERE). "This is a detective story. Without, we hasten to add, private eyes, blonds, beds, bigamy or bottles of bourbon. The setting is a luxurious interplanetary hotel three hundred years in the future . . ."
They say when one door closes, another opens; in the matter of the murder of the humanoid from Sirius II, it ain't necessarily so . . .
"If there's one thing I can't abide, it's practical jokers." "It's suspected murder and delicate interplanetary relations." "If Gideon Fell could have lived to see this . 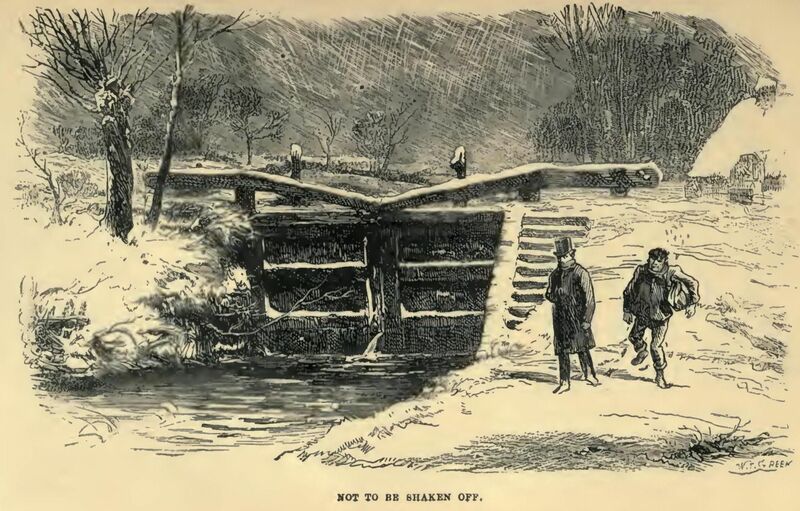 . ."
as it did in the Nineteenth or Twentieth Century. You can take my word for it, Inspector." "'I do hope, however, that your investigation won't disturb our convention too much. one there when I answered. Apparently the party had hung up, or it was a practical joke." and ISFDb (HERE) for the 411 on him. and HERE), and Antares (HERE and HERE). - Silicon-based life forms have been popular in SFF for a long time; see David Darling's Encyclopedia (HERE), Wikipedia (HERE), and Scientific American (HERE). - Another story blending SFF and tec fic is Fredric Brown's "Daymare" (HERE). 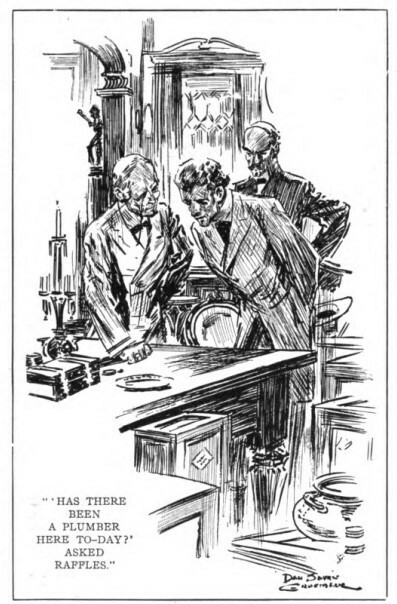 "The City Dies If Anyone Tries to Tail Us or Pull a Double Cross"
"The Three Thieves of Japetus." "Murder is always a cold-blooded crime any way you look at it. But for outright cruelty and barbarism there was no equal to the actions of—The Three Thieves of Japetus." The Bard basically nailed it when he had Falstaff complain, "A plague upon it when thieves cannot be true one to another!" - For more about SFF superfan Mark Reinsberg, see the Fancyclopedia (HERE and reference HERE) and the ISFDb (HERE). 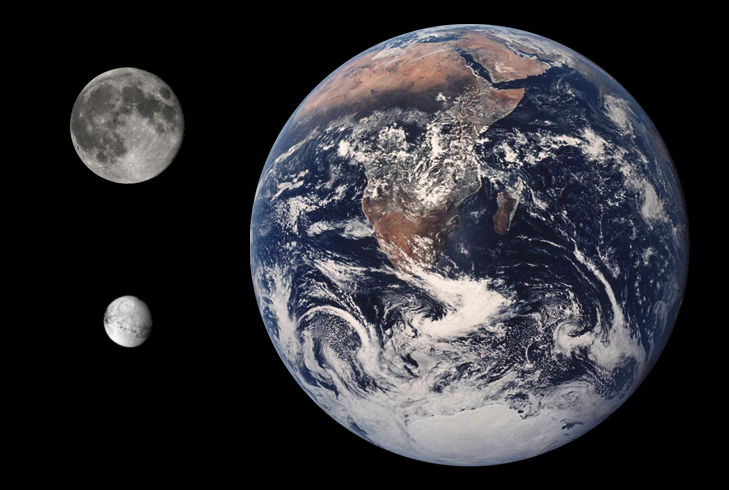 - Japetus, Titan, and Hyperion are mentioned in our story. These days the preferred spelling of Japetus, a two-toned natural satellite of Saturn, is Iapetus (HERE); quite a few science fiction writers have used Iapetus in their stories (HERE); a 3-D map of the real Iapetus is (HERE). 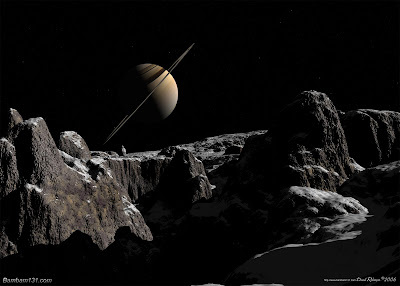 You can read more about Titan, Saturn's largest moon, in fact (HERE) and fiction (HERE), and the same goes for Hyperion (HERE) and (HERE). The Earth, the Moon, and (lower left) Iapetus (Japetus). "Every Burglar in London Was Asking for His Address"
First appearance: The Harmsworth Monthly Pictorial Magazine, March 1899. Short short story (5 pages, 5 illos). 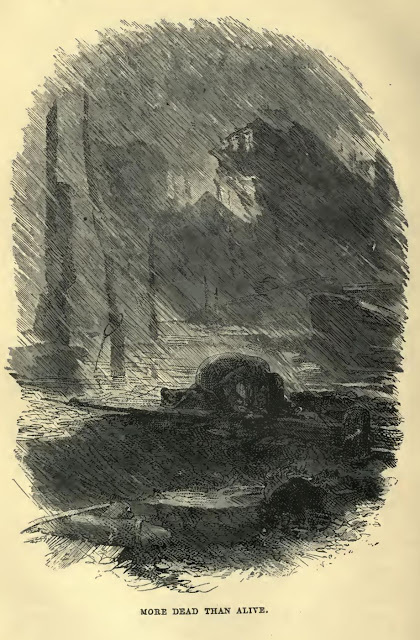 "The subsequent adventures of the great Battersby diamond may yet be traced halfway round the world, in the series of modest headstones which mark the last resting-places of its various lessees—for the jewel brought luck to no man, and people said that to possess it was to court a sudden and painful death." 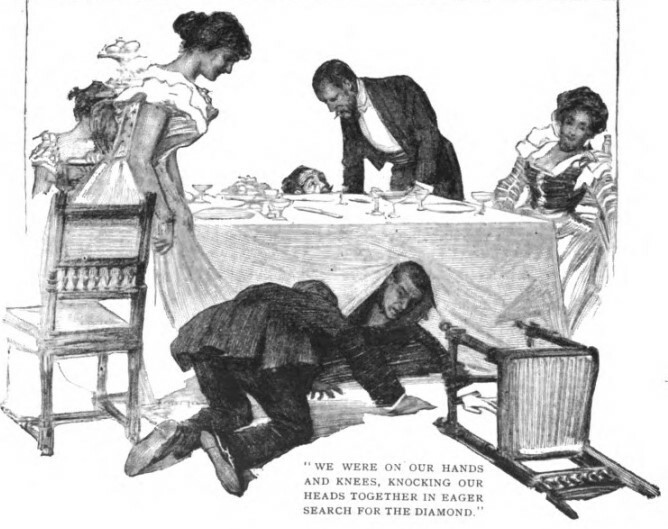 A hot rock indeed, as dangerous to its possessor as the Blue Carbuncle of recent memory; however, Battersby, the present owner of the diamond ("the eighth wonder of the world"—the stone, not Battersby), evidently likes to live dangerously and remains, to all appearances, unfazed by the diamond's dire reputation—until that heart-stopping moment when it disappears, precipitating a crisis that could almost certainly spell the end of a beautiful friendship* . . .
- FictionMags informs us that Gilbert Gover Floyd used two other noms de plume; as Duncan Storm he was a regular contributor of juvenile adventure tales to The Boys' Friend for over a decade, but as Julia Storm had just one story published in Schoolgirls’ Own. 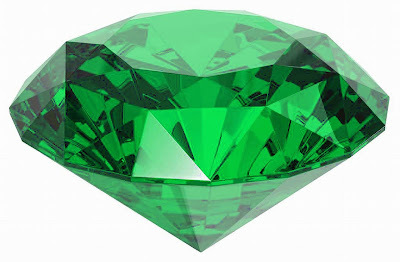 - The story, "Beating the Lights," dealt with a stone of a different hue (HERE). * . . . which, as you probably know, is spelled t-h-e e-n-d o-f a b-e-a-u-t-i-f-u-l f-r-i-e-n-d-s-h-i-p.
"A curious monomaniac. The man seems to believe everybody was acquainted with his mother." By Paul C. Squires (?-?). 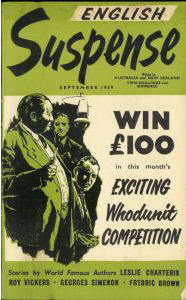 First appearance: The Journal of Criminal Law and Criminology, July-August 1938. "He is not a preacher. He is a master analyst in the field of criminology." 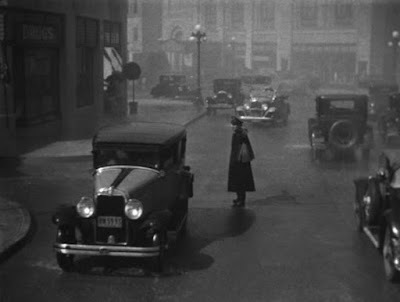 the criminalistic aspects in a systematic manner." nently in the criminal law of England." personae of Dickens, thereby revealing their true essence. are 'all too human,' to borrow a title from Nietzsche." the various kinds of motivation leading to anti-social conduct. He always asks himself: Is this man worth saving?" 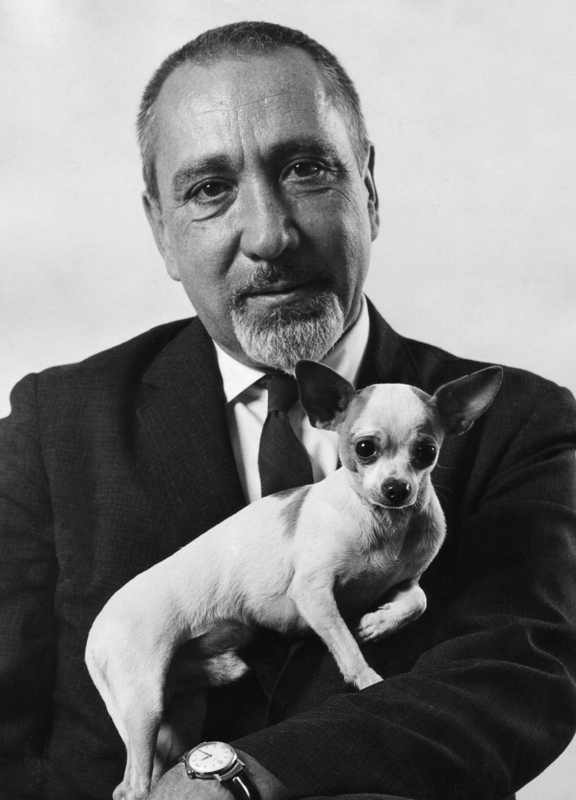 among the great literary psychiatrists." Typo: "Whether Orlick intended to will Mrs. Joe that night"
The Mystery of Edwin Drood (1870), over which much ink has been spilled since its first appearance; go (HERE), (HERE), (HERE), (HERE), (HERE), (HERE), and (HERE). 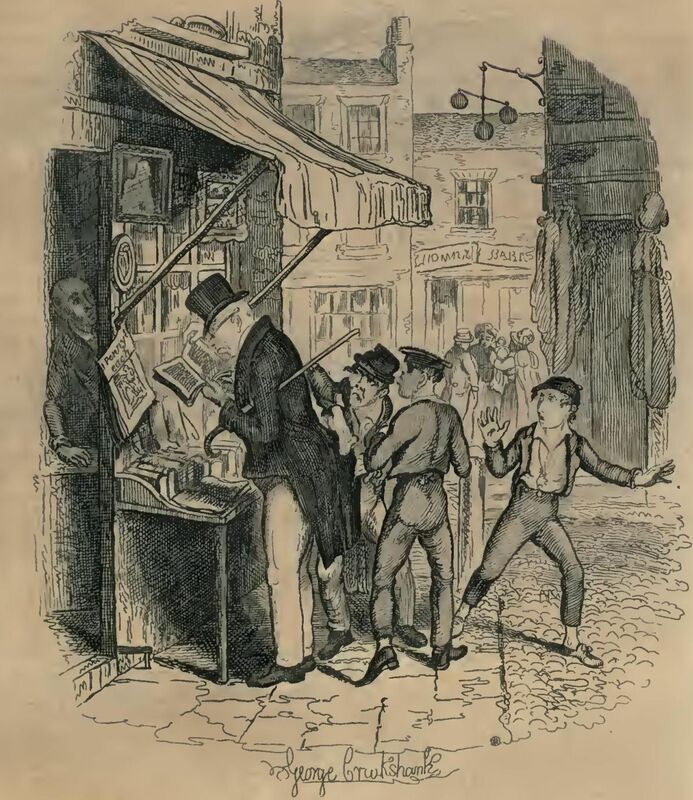 "As Dickens viewed the law with profound contempt, so he regarded lawyers with scant favor. Most of the lawyers in his books are shysters, as we would call them, or narrow, mean, ignorant pettifoggers. His books are crowded with familiar specimens. . . .
an earlier stage of society. . . .
and lawyers of England to dislike and despise. He was not, of course, an educated lawyer. I doubt very much if he ever read any law at all." 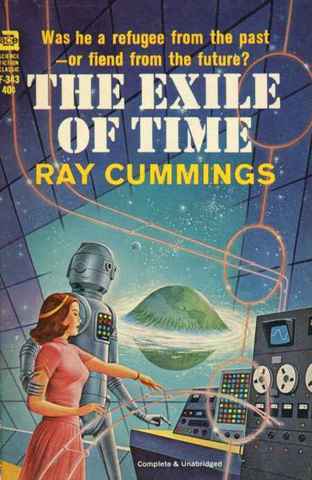 By Ralph Burke (Robert Silverberg, born 1935). 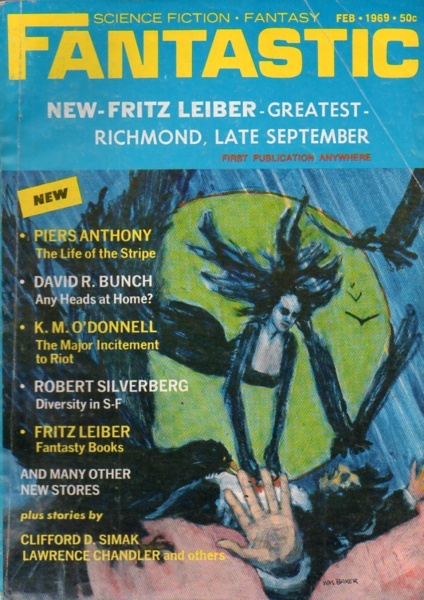 (FictionMags says this story was "ghost written by Randall Garrett"). 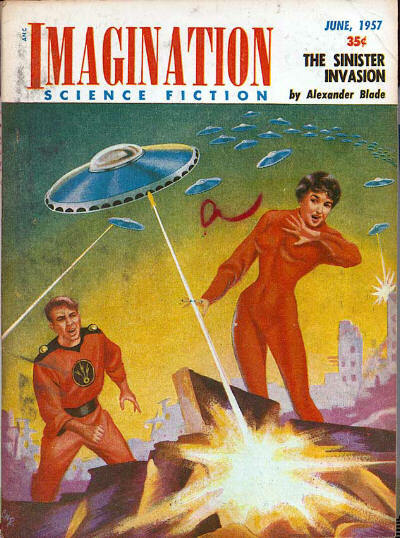 First appearance: Imagination, February 1957. 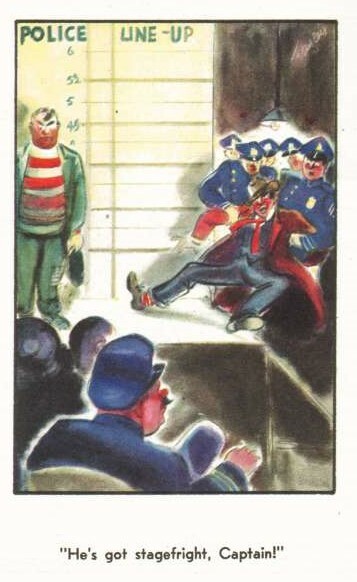 "He walked directly across the well-lighted safety area, and the guards paid not the slightest attention." It's highly unlikely that a thief ever stops to think that whatever he has set his mind on stealing just might steal him . . .
"She's a real beauty. When will she be finished?" "This afternoon. The boys are tightening the last bolts and putting in the final wiring now. The job's just about over, Pete." 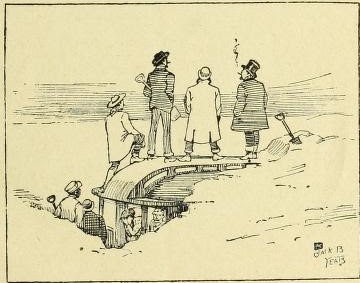 "An Earthman stepped out, an engineer named Harris who had apparently been making some last-minute adjustments on the ship." "It was simple to operate; all the pilot had to do was set up the coordinates of his target, turn on the hyperkinetic generator, and press the activator button. The generator itself did the rest. 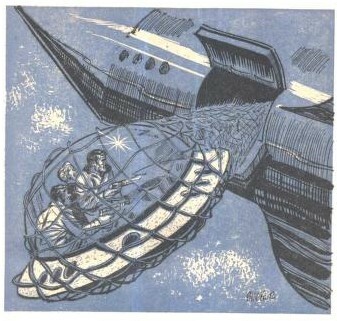 The field enclosed the ship, and instantaneously the ship was a hundred or a thousand light-years away." paid a visit to Silverberg (HERE). 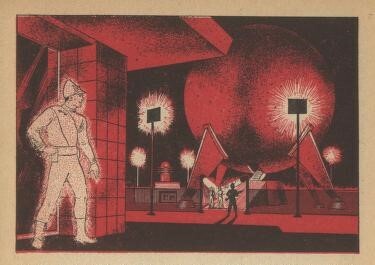 - Detailed discussions of teleportation reside on Wikipedia (HERE) and Atomic Rockets (HERE); the U.S. Air Force Research Lab's report (HERE) (PDF, 88 pages) actually consid-ered such a highly unlikely technical development. 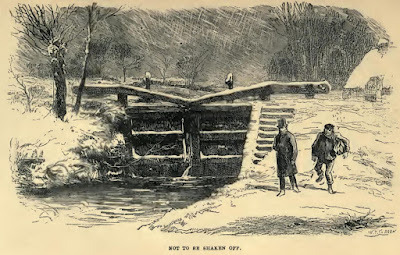 By W. L. Alden (1837-1908). 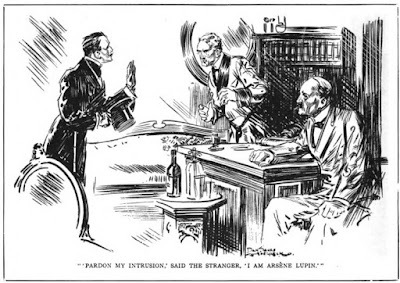 First appearance: To-Day, November 10, 1894. Short short short story (4 pages, 4 illos). "Stealing freight cars is something that happens every day, but stealing a Pullman was something new in the stealing line." A "killer" railroad car? Surely you jest . . . Comment: What looks like a case of criminality can, on occasion, be the result of a concatenation of innocent events. the SFE (HERE), and the ISFDb (HERE) for more about him and his work. - Go (HERE) for other railway-related stories.